Property 4: Casa De Emdeko 317- 2/2 Incredible Oceanview, Top Floor, AC, Elevators! Property 9: 3 BEDROOM AFFORDABLE CONDO! Property 11: Casa De Emdeko 332- Amazing Oceanview, Top Floor, AC included! Property 14: Near Town, Ground Floor w/ garden - Very Affordable! Property 20: Tropical Living, Hawaiian-Style Home. 1 Mile from Kona Town. Property 24: Kona Isle C28. Corner Unit, 2nd Floor, Ocean Views, & Air Conditioning! Property 25: Amenities Abound in Kona Town! Romantic Sunset Ocean Front Unit !! 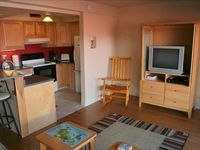 Property 26: Romantic Sunset Ocean Front Unit !! The amenities with this condo were impressive. There really is everything you could need inside. The view from the balcony is beautiful and the property is well taken care of. In addition to the property's small pool, there is a public pool right next door. However, it wasn't in the best shape when we visited. The location is close to Kona, but we found it far enough away to necessitate driving and parking downtown. We (couple fraom germany) stayed at this condo in January 2009. We loved it! Quiet, complete and comfortable, nice people, rather small with about 60 units. Clean pools, wonderful gardens, nice small (artificial) beach. Very good and uncomplicated owner - thank you, Chris!